There's nothing cuter than a goldfish. They are small. They are bright and distinctly cheerful-looking. They are a staple of fish tanks around the world. But Australian scientists are not so charmed with the little darlings. This is according to Johnny Lieu, reporting for Mashable. Not only are they invading Australian rivers, but they're also growing to gigantic sizes. 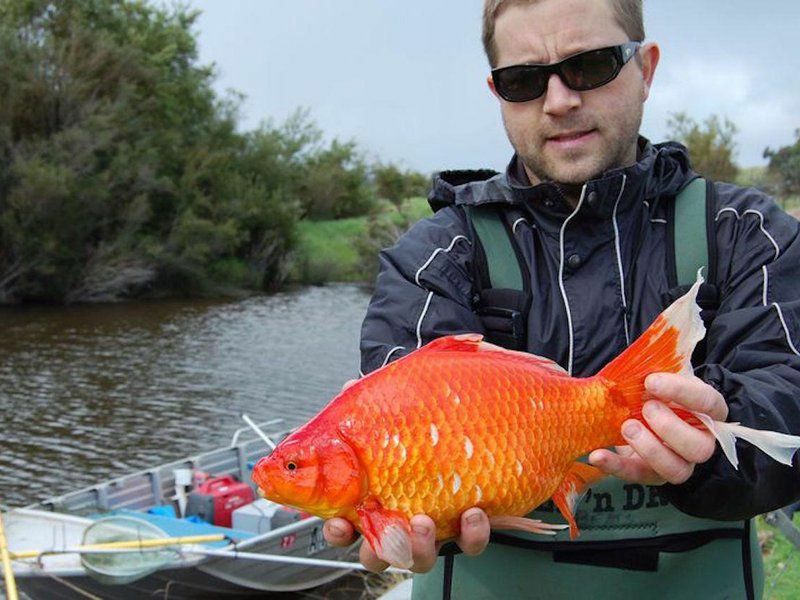 The huge goldfish of Western Australia are anything but adorable. Over the last 15 years, Lieu reports, they have taken to freshwater rivers in ever-greater numbers. A new study has been published in the journal Ecology of Freshwater Fish. Researchers reveal how the fish have spread throughout Australian waterways. The fish have grown ever larger as they go. The fish are not just big, the study found. They are incredibly mobile. In just five days, they can travel an average of one mile in the river. One fish went a whopping 3.35 miles in a mere 24 hours. Over a year-long period, researchers tracked the movements of goldfish in the lower Vasse River. The researchers used acoustic testing and tagging. This was to determine what fish were doing. The goldfish that were studied didn't just swim around. They appear to have spawned. Ecologists call it "spawning migration." That's a pattern in which fish breed in areas far away from their normal hangouts. That's bad news. This is according to Stephen Beatty. He is a senior research fellow at Murdoch University's Centre for Fish & Fisheries Research. He led the study and spoke with Smithsonian.com. "The fact that they're so big is really symptomatic of the other impacts in the river," Beatty says. The river, he explains, is warm and stagnant. Those are perfect conditions for pet goldfish. They make their way into waterways after being released by their owners. "The goldfish have really capitalized on that," he says. Not only do the goldfish disturb the habitat and potentially consume invertebrates and fish eggs, his team suspects that they are also spread disease. Carassius auratus is the scientific name for goldfish. They originated in Asia. They are kept as pets the world over. But when they are released into the wild, the well-behaved fish tank friend becomes a foe to other wildlife. They grow without the constraints of a tank and commercial fish food. Their feeding frenzy in the wild also causes mud and debris to rise from the bottom of the river. That, in turn, fuels the growth of aquatic plants. This can degrade the river even further. And while splashing around in the warm, nutrient-rich environment they love, the goldfish breed like crazy. It's become an issue throughout the world. A Boulder, Colorado, lake teems with the fish. In Alberta, Canada, the problem has become so bad that officials pleaded with the public not to release them. For Beatty, all that press is a good thing. "They're a bit of a flagship because they do get that media attention," he concedes. But their star status has a downside. That is the misconception that if your goldfish is tiny, it won't hurt to drop it in a lake or river. "Introduced species can have really unpredictable impacts. Even cute and fuzzy ones," he says. "Please don't release anything into rivers or wetlands that are not native there." I believe that goldfish should stop eating and spawning eggs .They are destroying various habitats. The goldfish interfere the existing habitat by eating things that can cost it to grow and spreading disease that can cost a sickness to other wild life around that drink water.A big goldfish can turn clean water into dirty water which it's not health or safe for other animals to drink. I think the goldfish interfere with other goldfish because they think of they're eggs as food. The fact is that it is so big that it can really symptomatic. The goldfish interfere the existing haditat by eating things that are not spoused to eat that is why. I think that the reason is that they like to explore. 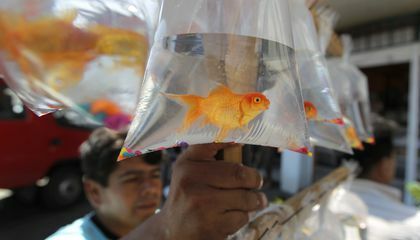 The goldfish interfere by destroying the habitat.They are destroying the it by spreading a disease in the water.